Fishing slow and low in the spring sometimes produces the biggest fish of the year. I always mistrust fly fishers who mouth the platitude, “I don’t care if I catch any fish or not; it’s just nice to get out there.” Sure. Then why don’t you leave the rod home and save yourself the trouble of thrashing around in the bushes with a 9-foot stick? After a long winter, most of us are ready to chew through our restraints, but, honestly, isn’t it nice to hook a trout on your first day out? Won’t it make that long day on the water a touch brighter? 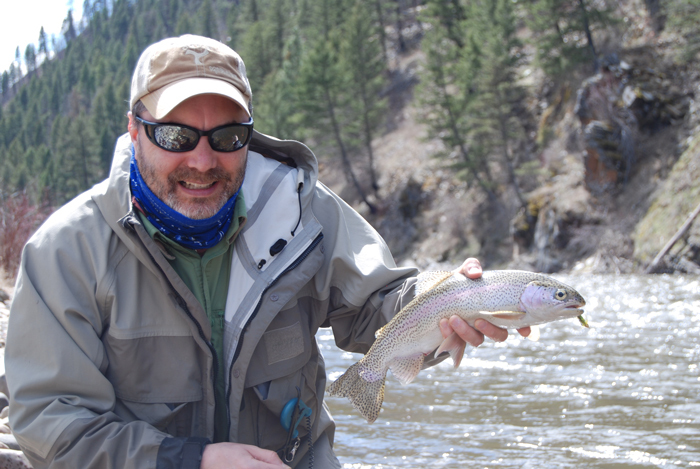 Early season fly fishing is often frustrating—high water keeps your fly away from the fish, cold water makes fish sluggish, and often no insects hatch so trout don’t feed actively. My ace in the hole is to fish streamers early in the season, but you have to forget what worked for you on that float trip last summer. Typically, when water temperatures are between 50 and 65 degrees, trout are not only active; they are also aggressive and often chase a streamer 10 feet before smashing it. With water temperatures in the 40s, trout may not move a foot to take a fly, and they’ll seldom chase a fast-moving fly. This Rock Creek beauty fell for a dead-drifted Olive Woolly Bugger. One one spring day, I was fishing a Virginia mountain stream full of big rainbows with fly tier and guide Dave Hise, inventor of the Hise Hex, Eggi Juan Kenobi, and Sly and the Family Stone. Dave knew just where the fish were and positioned me upstream of a good run, telling me exactly where to place and drift my fly. He positioned himself on the bank above the spot my fly was swinging into, and even though I was fishing a heavily weighted streamer with a tungsten head, he yelled, “You may not believe it, but that hole is six feet deep and your fly is swimming about a foot under the surface.” So not only were the fish not going to chase my fly, they probably couldn’t even see it. A sinking tip line would have gotten the fly deeper than the floating line I was using, but I didn’t feel like walking back to the car. So I moved downstream of the hole and cast my fly upstream, stripping line just enough to keep tension on it and perhaps give the fly an occasional twitch. Three fish later, I was convinced that I needed to be slow and deep. For the rest of the day, I fished my streamers upstream, and the big rainbows took the fly either on a dead drift or with just a subtle twitch here and there. Not a single fish chased the fly when I fished the conventional across-stream cast with a fast retrieve. Flies that offer a lot of wiggly action in the water work best with a slow presentation. With a floating line, cast quartering upstream, and then lift the rod tip sharply about three inches after your fly hits the water to drive it a little deeper. A sharp upstream mend will get the fly even deeper. With a sinking-tip line, you can use an across-stream presentation as long as you throw a couple of upstream mends into the drift. Keep your rod tip high as the fly drifts downstream, and try to keep the fly in the same current lane with an occasional strip followed by a pause. Try fishing your streamer totally dead-drift on a sinking tip line, without any strips other than those needed to keep your line tight. Don’t worry about missing strikes. 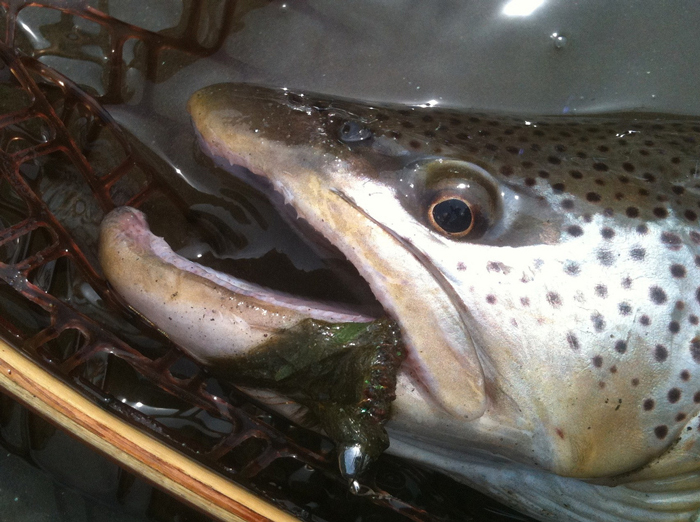 Even in early season, trout take streamers pretty hard, and you’ll see the line move when they eat it. Try fishing a dead-drift streamer with a strike indicator and one or two split shot a foot above the fly on the tippet. Fish it just like a nymph, dead drift, with no movement at all. You might even tie a dropper on to the end of the streamer hook and add a small Hare’s Ear or Prince or Pheasant Tail nymph to double your chances. 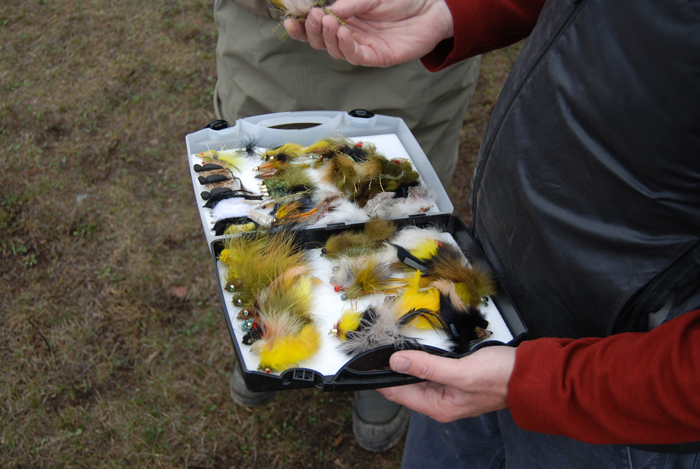 Flies that have some movement of their own, like ones with marabou and rabbit fur, work best under these conditions. Flies with brass (or even better tungsten) beads get the fly deeper in a hurry. Color does not seem to be that important, although black in dirty water and white or yellow in clear water seem to offer some advantage. Change colors if you don’t get any strikes but don’t worry too much about pattern, size, or color. A size 6 or 8 fly that wiggles in the current should work fine. A suggested list of flies follows. Good article. I always have good luck in the winter and early spring with a size 10 or 12 zonker dead drifted under an indicator. Lots of little dead minnows floating down the river during this time of year.